–Pakistan’s Prime Minister Nawaz Sharif on Tuesday ordered that “blasphemous” content on social media websites be removed or blocked and those posting such material “strictly punished.” Blasphemy is a criminal offense in Pakistan and can carry the death penalty. -Shortly after crossing the Rio Grande into the gang-infested border city of Reynosa, dozens of Mexicans deported during U.S President Donald Trump’s first days in office said they would soon try to head north again – but this time to Canada. -Researchers calculated that the world’s spiders consume between 400 and 800 million tonnes of insects and other critters annually. 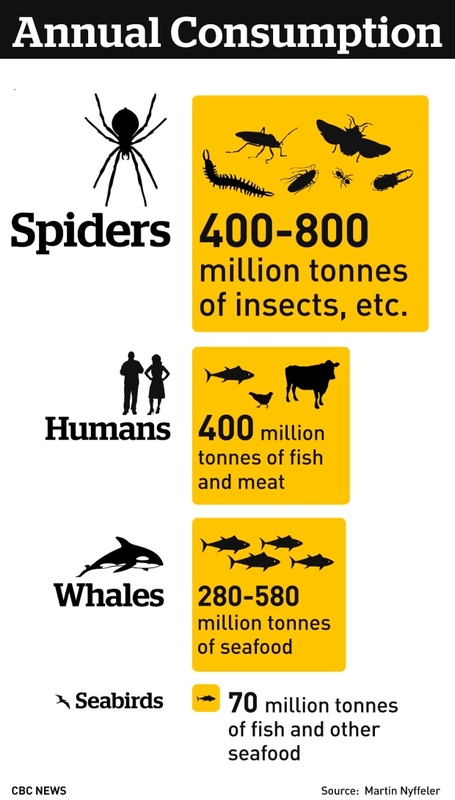 In comparison, humans consume about 400 million tonnes of meat and fish each year. Mar 22nd, April 5th, Toronto: CFIC T.O. – Living Without Religion. Every 2 weeks on Wednesday, a place for people to share their desire to throw away the burden of religious indoctrination and antiquated dogma. April 2nd, Toronto: CFIC T.O. Atheists & Friends Sunday Meetup. CFIC Toronto Atheists & Friends Sunday Meetup is a fun discussion group focusing on a range of topics within the realm of atheism. They’re open to the public and everyone is welcome to join in! CFI Ottawa UnSermon; Sunday afternoons (12:30 pm), meet and share your ideas with Atheists, Freethinkers, and Humanists from the Ottawa area. CFI Canada is proud to join Humanist Canada, BC Humanist Association, Canadian Journalists for Free Expression and a growing list of other organizations in launching Petition e-382 in opposition to Criminal Code Section 296 – Canada’s blasphemous libel law. Nobody joins a cult. You join a self-help group, a religious movement, a political organization. They change so gradually, by the time you realize you’re entrapped – and almost everybody does – you can’t figure a safe way back out.